A reduced service operates with all trains operating between Paddington and Heathrow Terminal 4, and they do not call at Acton Main Line. Some lines between London Waterloo and Clapham Junction (including about half of London Waterloo station) will be closed all day Sunday for track maintenance. 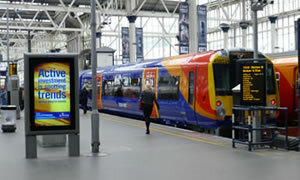 A reduced train service will run in and out of London Waterloo. All lines in the Wimbledon, Surbiton and Kingston areas will also be closed on Sunday and replacement bus services will run on routes passing through this area. After 2100, a reduced service operates with all trains operating between Paddington and Heathrow Terminal 4, and they do not call at Acton Main Line.